World 19-5 is the fifth level of World 19 of Super Mario Challenge from Super Mario Maker for Nintendo 3DS. It is exclusive to the Coursebot. The level starts out in an empty area with a Warp Pipe. After taking this pipe, there is a short bit before the player hits a P-Switch. After hitting the P-Switch, the player needs to run across coin that turned into Brick Blocks, and can collect Brick Blocks turned into coins. Before the P-Switch timer runs out, the player needs to hit another. 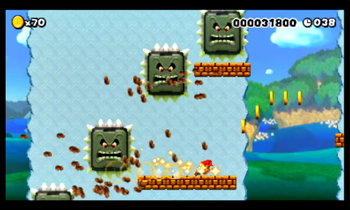 After some ground, the player needs to get past two Goomba stacks and wait for Bill Blasters take out Piranha Plants and two coins turned into Brick Blocks. The player then needs to do a quick wall jump section and reach the Warp Pipe back to the main area. Back in the main area, the player needs to hit a P-Switch, but not necessary in the last P-Switch’s timer. After hitting that one, the player needs to run past Thwomps. After jumping over the last Thwomp, the player needs to quickly wall jump then go back down and reach the Goal Pole before the timer runs out. If the player gets there before the P-Switch timer expires, they can get the top of the Goal Pole. Goomba - Get two lives and then get another from the Goal Pole. Bowser - Reach the goal with at least 20 left on the clock. This page was last edited on September 10, 2018, at 17:36.